Whenever I am thinking about dining out in beautiful Downtown Winter Park, often times Mexican food does not cross my mind. 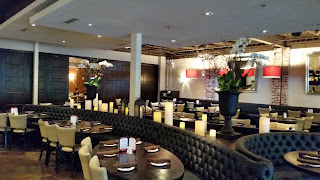 There are lots of dining options in that area from upscale to casual, but for some reason I often overlook Cocina 214. I am a big fan of authentic Mexican food and the Americanized Tex-Mex food as well, so I was delighted to attend a new menu preview event for Cocina 214. What exactly is Cocina 214 you may ask? Cocina is Spanish for Kitchen, and the 214 part comes from the Dallas area code, because the owners, who are from Texas, missed the Tex-Mex and Mexican foods they grew up on. The menu is full of contemporary Mexican and Tex-Mex inspired dishes that combine bold flavors with the freshest local ingredients. Items like Queso Fundido and Guacamole at Cocina 214 may be your average Tex-Mex standard fare, but you will be hard pressed to find Fried Avocado Bites at any other Mexican restaurant in Central Florida. The same goes with the rest of the menu here too. Items like Snapper Frito Tacos, Truffle and Mushroom Quesadillas, Cauli Frito Tacos and Corn Crusted Mahi are sure to impress the adventurous palate. If you want more traditional, Cocina has that too, with Chicken Tamales, Brisket Quesadilla and an assortment of Tacos and Fajitas. Fried Avocado Bites are lightly breaded hass avocados fried and served with chipotle cream dipping sauce, and are very delicious. The Mango Ceviche features snapper, serrano peppers, red onion, red bell pepper, citrus and mango. For something a little lighter, Isidro’s Caesar salad is made with romaine lettuce, cotija cheese, fried onions strings, grape tomatoes, homemade croutons and Caesar dressing. The Mexican Corn is a tasty Aperitivo, or appetizer with grilled corn, cayenne pepper, lime, cotija cheese and queso fresco. Enchiladas are served Mexican-style with romaine lettuce, queso fresco, onions, sour cream, grape tomatoes & veggie rice. You can add protein to them such as chicken or beef and you have an option of sauces as well. Snapper Frito Tacos are traditional Mexican street tacos with lightly fried wild snapper topped with coastal slaw, pico de gallo and a chipotle cream sauce. For an awesome vegetarian option, the Cauli Frito tacos are lightly fried cauliflower, coastal slaw, red bell peppers and chipotle cream sauce. These tacos were crispy and tasty and had a great taste. Another item not readily found at most Mexican restaurants, the Snapper Veracruz with wild snapper, tomato, olive, caper, herb topping and veggie rice was quite delightful. For the burger lover, Maria’s Gourmet Burger is sure to hit the spot. This burger features grilled pineapple on an Angus beef burger, Olde Hearth Bread poppy seed bun, Monterrey jack cheese and is served with grilled Mexican corn. You can never go wrong with Churros for a sweet ending. The Churros at Cocina 214 come with a dulce de leche dipping sauce and are fantastic. If you’re looking to dine out in the charming Winter Park Historic District, or want an authentic Tex-Mex dinner, consider Cocina 214 and put it on your radar. This restaurant is perfect for every occasion and you and your guests will be sure to enjoy.